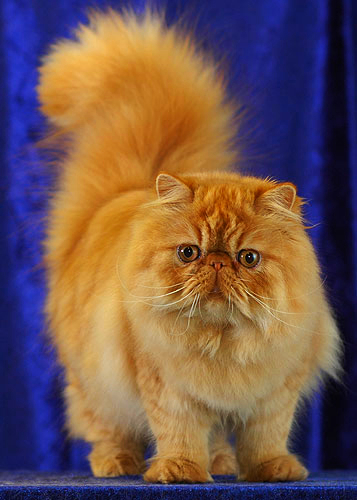 The Persian is one of the most popular and beautiful of cat breeds. It has a royal look to it with that long, thick coat and typical brachycephalic type skull. Americans have fallen in love with the Persian cat; even with the huge amount of grooming that is required to make the Persian stand out with that long flowing hair-coat of theirs. It is one of my favorite breeds of cats. Sweet, docile yet able to stand up to animals much larger than itself, the Persian just loves being around people. My favorite Persian throughout the years was a cat named “Elizabeth”. Right before I left a practice to start my own, I did a Cesarean section on a Red Mackerel Persian queen. All kittens survived. One of those was purchased by Nancy who became a good friend and client of my new practice in the late 1980’s. When no one was around, she had the run of my office. She knew every nook and cranny. I used to call her “The Queen” or “Queenie”. We used to play hide and seek. Time went by and when she was about 18 she was too ill to live any longer. I brought her into the world and 18 years later I took her out of it. That was one of my saddest days of medical practice. I loved her. One of the distinguishing factors of the Persian is that the tail is carried parallel to the cat; that is held straight out. All other cats (except the Ragdoll) carry their tail erect and perpendicular to the body. Like the Himalayan, Persian owners have to wipe the eyes and skin folds around them to keep the tissues healthy and prevent staining below the eyes. That brachycephalic skull leads to breathing problems; particularly when they have upper respiratory infections. A problem, like Elizabeth’s mother, and a lot of female Persians, is that big head of theirs means a lot of them are delivered by Cesarean Section. Persians will always be loved. What you see with a Persian is what you get! A breed of cat that is almost human. Better yet, more than human. Learn more about the Persian at Animal Planet’s® Cat Breed Selector.